Mines in Africa collectively produce over 60 mineral and metal products where Africa is the major producer of the world’s most important of these minerals and metals. This includes: Gold, Diamonds, Uranium, Manganese, Chromium, Nickel, Bauxite and Cobalt. What is interesting, is that although Africa has so much to contribute, its contribution in regards to major metals (Lead, Zinc and Copper) is less than 7%. It is estimated that Africa hosts about 30% of the planet's mineral reserves, of which 40% is of Gold, 60% of Cobalt and 90% of Platinum. This makes Africa a very strategic producer of these precious metals. Because of the number of mines in Africa, there is a huge demand for specialised labour. Countries doing mining extensively: Botswana, South Africa, Ghana, Zimbabwe, Mozambique, Tanzania, DRC, Angola, Sierra Leone, Namibia, and Zambia. With many job opportunities in the mining sector all around Africa, these positions can vary from fly in fly out (FIFO), to “you have to stay for x months”, to getting danger pay, to staying in camps. These jobs can be so diverse, and so one needs to fully understand the requirements and expectations before commencing employment. Job in mining can be from high risky positions to the general office jobs, from start-up mining exploration companies roughing it, to well established companies, and from systems in progress to plenty of red tape. Working in Africa in spite of certain political conditions from place to place is exciting, and favoured by many. AdoGreen Africa is a specialist recruitment agency focusing on finding local talent in various African countries within the mining industry. 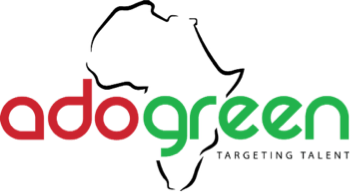 Why AdoGreen Africa is so effective in working into Africa, being able to target local candidates, is owing to extensive experience in pioneering within unfamiliar locations and successfully identifying the best recruitment practises for these type of situations for expanding and established companies. Our methodologies have been developed to effectively target and network with local candidates.